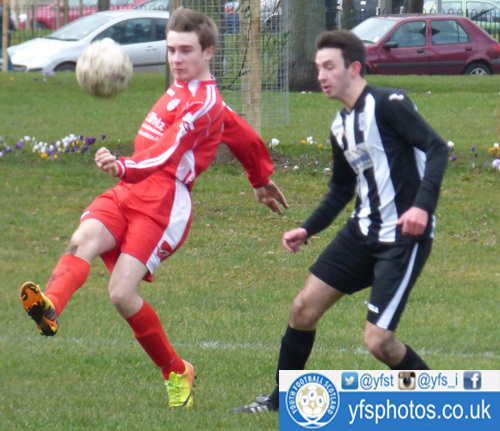 Leith Athletic YFC proved too strong an outfit for Easthouses to deal with throughout the ninety minutes, which saw the home side comprehensively secure an 8-0 victory. Leith Athletic played with flair, pace and determination and showed the two sides of their game as they went toe to toe with a physical side, but also showed their fluent attacking qualities simultaneously. Despite the fact that the game would ebb into a one sided affair in favour of Leith, it was the visitors who started brightest. An early foray forward from Easthouses almost saw them in front. A neat cut back from Ross Pratt found Cameron Archibald, who’s outside of the foot effort, which looked to be heading for the roof of the net, was well held by goalkeeper Lewis Buchanan. Leith then looked to respond to the pressure from Easthouses through Chris Robertson as he whipped a ball across the face of goal. All the ball needed was a touch and the deadlock would have been broken, but nobody was there to capitalise. It wasn’t long before the first goal found the net though. Brandon Hunter played the ball into Brodie McKenzie. He controlled the ball well, swivelled and stuck a low shot past the goalkeeper to put his side one up. Leith Athletic had their tales up and they were pushing for the second goal that would put them well and truly in the driving seat. A couple of efforts from Robertson and Hunter respectively warmed the palms of the keeper but did not give him much trouble. It was a warning sign of what was to come if anything else. Sam Lawrie looked to get in on the action as he picked the ball up in midfield and attempted a speculative effort that was weak and drifted well wide of the target. The Easthouses defence were under the cosh and were struggling to cope with the attacking threat of Leith Athletic. Leith’s lead was finally doubled when a foul in the box resulted in the referee pointing at the spot, it was not the last time he would do so either. Hunter stepped up to take the kick and the ball was emphatically dispatched into the top right hand corner giving goalkeeper Ryan Gordon not a chance. Two soon became three as Liam Urqhart tapped the ball home into an empty net to set his team on the path to victory, which was looking very likely at this point in time. Easthouses were battling well and seemed to be managing the game relatively well, it was just the fact that Leith Athletic were clinical in front of goal which is pivotal in a game of football. Tricky forward McKenzie had a fantastic small run as he dribbled past several defenders and into the box, only to be upended which gave the man in the middle no choice but to award another penalty. This time it was midfielder Oban Anderson who stood over the ball. The penalty taker may have been different but the result was not as he stroked the ball into the net albeit with a helping hand off of the post. The second period was, in honesty, a one sided affair with Leith dominating matters and taking complete advantage of the capricious nature of the Easthouses backline. That theme continued when McKenzie latched onto a lofted ball over the top of the defence and as the ball sat up he wonderfully volleyed it into the top right hand corner. A strike of the highest quality. Another chance instantly fell Leith’s was and it was almost a carbon copy of the previous goal except on the opposite side. Robertson picked up the through ball this time but his resulting shot was pulled just wide of the target. McKenzie was proving his worth and he chipped in with an assist this time as he hit the bi-line and cut the ball back into the path of Johnny Brown who powered his shot into the roof of the net to tick the score over to 6-0. Then McKenzie provided the highlight of the match with a piece of skill of the highest echelon. He chipped the ball past the foot of one player and the scooped the ball over the head of another and collected it again at the other side of him. It was Gary Mackay-Steven-esque, however it was not to the liking of some of the Easthouses defenders who then took him down inside the box once more. Again the referee pointed to the spot. This time the goalkeeper, yes goalkeeper Lewis Buchanan was on hand to carry out penalty duties. Despite what some people say about goalkeepers taking penalties, Buchanan’s was excellent as he slotted the ball into the bottom right hand corner to make it a 7-0 lead for Leith Athletic. Robertson compounded Easthouses’ misery late on when his powerful run in on goal was coupled with a calm and composed finish to slide the ball past the goalkeeper and into the net. Brodie McKenzie - Chipped in with two goals and an assist (two assists if you count being fouled for the penalty) and performed a hatful of tricks all game. He was a delight to watch. Mark Meaney - Played well when he came on and looked a composed player in the middle of the park. Didn't put a foot wrong. When Brodie McKenzie scooped the ball over the defenders head and collected it on the other side to complete what was a magnificent piece of trickery. Cameron Archibald's early strike which almost had the visitors in the lead.